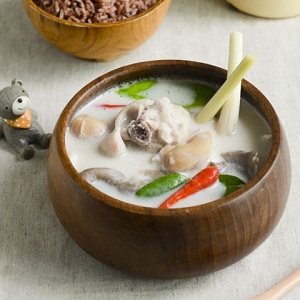 In a pot, combine chicken broth, Rasaku coconut milk, kaffir lime leaves, coriander root, chilies, galangal and lemongrass together, bring to boil over high heat, turn to medium heat and continue simmer for 1minute. Place abalone mushroom and chicken in the pot and bring back to boil. Turn to low heat and cook till chicken is done. Season with fish sauce, lemon juice and sugar, and ready to serve.